The timeline shows data on the box office revenue generated by 20th Century Fox in North America from 2000 to 2018. In 2018, the revenue amounted to about 1.08 billion US dollars. The studio celebrated its most successful year in 2014, when its box office revenue neared 1.77 billion US dollars. This was thanks to box office hits such as "X-Men: Days of Future Past" and "Dawn of the Planet of the Apes". Twentieth Century Fox Film Corporation is a subsidiary of the Twenty-First Century Fox, Inc. – one of the successors of News Corporation, after the corporation was split in June 2013. 21st Century Fox took over the company’s broadcasting and film divisions. 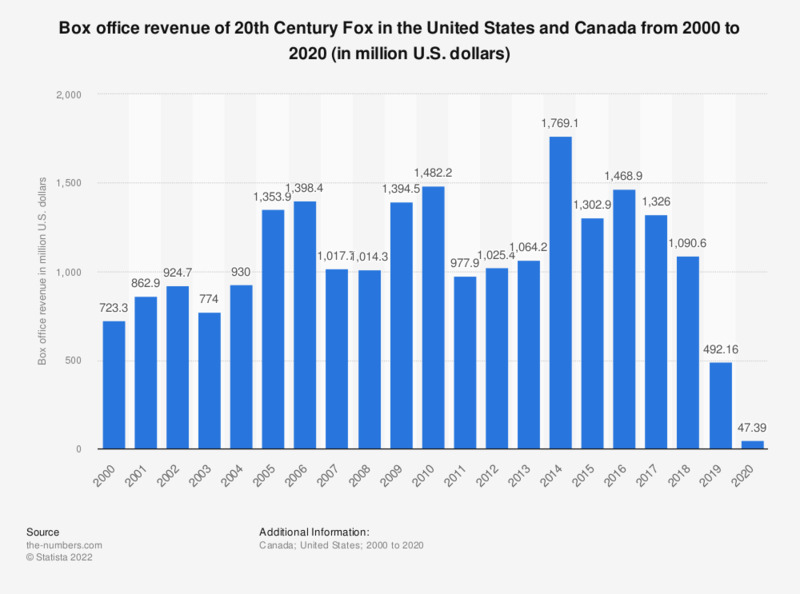 In its fiscal year 2018 (ending June 2018), 21st Century Fox reported revenues of 30.4 billion U.S. dollars, out of which almost 8.75 billion came from the film entertainment segment.